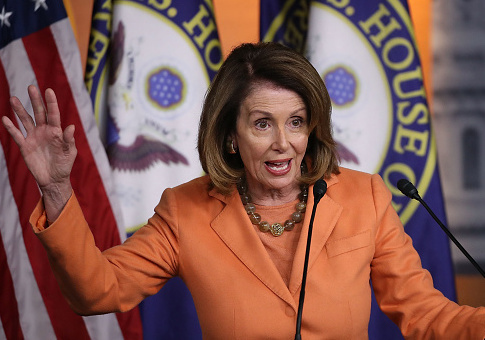 House Minority Leader Nancy Pelosi (D., Calif.) said in a Wednesday interview with the Tampa Bay Times that she loves former Florida Congressman Alan Grayson (D.) but wishes he would run in a different district. "I love Alan Grayson. He was a very progressive member of Congress," Pelosi said. "I wish he would run in a different seat. I would love to have him back." Grayson announced on Tuesday he will run for his old seat in Florida’s 9th Congressional District, challenging his successor, Rep. Darren Michael Soto (D., Fla.). Pelosi said she supports Soto, who is the first Puerto Rican member of congress from Florida, and that she is "sad" Grayson choose to challenge him in the Democratic primary. "But Darren is there now and is very important to us in terms of generationally and also in terms of issues that relate to Puerto Rico, which are a priority for us to address. I have supported Darren Soto," Pelosi said. "I'm sad that Alan chose to come back in that race." When Grayson announced his campaign, he defied party leaders who told him to not run for the seat. "I don’t need anyone’s permission to run for office," Grayson said. "What I’ve done is ask the people. I can run anywhere in the state; I could run from Key West to Pensacola." Before Grayson decided to run against Soto, he contemplated challenging Republican Rep. Daniel Webster or seeking the seat Republican Rep. Dennis Ross is vacating. In 2016, Grayson left his House seat to run for the Senate against fellow Democrat Patrick Erin Murphy in a primary. The former congressman promised his Senate campaign would be one that would "live until the end of time." Grayson lost the primary by over 30 points. Looking back, Grayson has said he regrets running for Senate. "I wish I hadn’t run for Senate," said Grayson. "If I hadn’t run for Senate, I’d be in Congress right now fighting Donald Trump tooth and nail right now. I think Donald Trump should be impeached." Grayson plans to attack Soto for not backing impeachment of President Donald Trump. Pelosi has previously said impeachment is "not someplace that I think we should go." This entry was posted in Politics and tagged Alan Grayson, Florida, House Democrats, Nancy Pelosi. Bookmark the permalink.